If you’ve been seriously injured, the path to understanding your legal rights isn’t always clear and hiring a lawyer for the first time can be daunting. In the time you have to recover from your injuries, you also have to ensure you take the right legal measures before signing any documents presented to you by ICBC or another insurance company. It’s in your best interest to have the full information and getting legal advice early on is a crucial step in the initial information gathering process. What are contingency fees and agreements? Which lawyer is right for my case? How do I check a lawyer’s track record? Based on this information, an experienced and professional personal injury lawyer can often provide sound advice on what your legal rights are, all the while ensuring they can advance your claim and getting you the compensation you deserve. Personal injury lawyers, like ours at Murphy Battista LLP, usually offer free initial consultations because of how important it is that you know what your claim is and what your rights (and obligations) are. 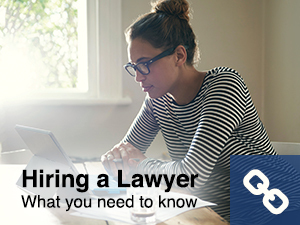 Visit our Resources page to learn more about hiring a lawyer.